Over the last 7 days, the Greater New York Red Cross provided emergency assistance to 104 adults and 27 children following 40 local disasters. Here are some highlights from last week and a preview of upcoming activities (see below). #GetAlarmedNYC was yet again in full swing this past weekend working to make residents of Queens safer. Sign up here to be a part of this amazing campaign. The Red Cross salutes members of the James H Vernon School Leader’s Club who organized a fundraiser to raise money towards Hurricane Matthew relief efforts. In our latest Instagram #MyRedCrossLife post, Brian Gerber recalls his experiences as a volunteer and what it’s meant to him over the years. Thank you Brian for all your kindness and your time! American Red Cross is very proud to announce a new official charity partner: the Harlem Globetrotters! Check out this video of Zeus stopping by our national headquarters in Washington D.C.! Phenomenal job by Red Cross CEO, Josh Lockwood, moderating the “Miracle on the Hudson” panel at our Young Patrons event on Wednesday night. The panel featured a passenger, an air traffic controller and our very own Red Cross volunteer, Sally Phipps. During the early hours on Tuesday, the Red Cross responded to a fire that ripped through a senior citizen’s home in Putnam County that left as many as 35 residents homeless. Red Crossers were on site to provide displaced residents with assistance and emotional support. Thanks to the amazing people who dedicated their time to help brighten lives that morning. Since early October, the Red Cross, including several of our Greater NY staff and volunteers, have been on the ground in communities impacted by Hurricane Matthew providing urgent relief to tens of thousands of residents. 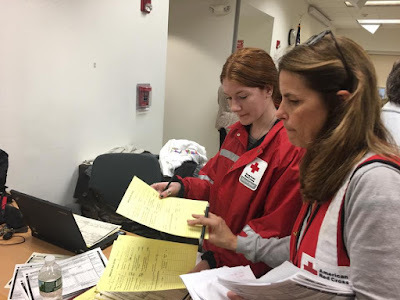 Long Island Red Cross CEO, Neela Lockel is featured in a new article highlighting her deployment to South Carolina. Visit our YouTube channel to watch Neela’s on-camera interview! Take a moment to watch Red Cross volunteer Richard Sanford teach preparedness skills in Mandarin to over 60 residents. Preparedness training is now offered in several languages including Chinese, Spanish and Russian. Be sure to sign up for a session today! AIG CFO, Sid Sankaran got together with Red Cross staff during last Tuesday’s Leadership Academy. We’d like to thank AIG Insurance and their awesome CFO for coming in and sharing his career wisdom. Nov 23, 25, 28: Red Cross blood drive: 2 to 7pm: 520 West 49th Street, Manhattan. Schedule an appointment to donate today. Nov 30: Looking for an exciting challenge? Join the Volunteer Services team as a full-time AmeriCorps member in NYC & LI. Put your idealism into action by helping to recruit and engage volunteers! Dec 3: #GetAlarmedNYC is coming to Staten Island to help make the community safer one home at a time. Volunteer to help out, or sign up to get a free smoke alarm installed in your home. Dec 5: Supporting Volunteer and Managing Teams Workshop at the Metro NY Chapter. If you are a supporting volunteer or team manager, please take advantage of this engaging course. You can sign up and learn more about SVMT here. Dec 5: The Port Washington Crisis Relief Team is sponsoring a special blood drive at the Port Washington Library (1 Library Drive) on Monday, December 5 from 3:30 pm to 7:30 pm. Make an online appointment please visit redcrossblood.org and use sponsor code: pwcrisisrelief. We hope to see you there!